The passion of Stefan Gradinarov to cool weapons started in his childhood. He had been fascinated by adventure novels whose characters are trappers, hunters, musketeers, pirates, knights and others. The lives of these strong and brave men would be unthinkable without cool weapons. Stefan made his first knife when he was about 20 years old. At that time he began working in a military industrial factory. Gradually he improves his skills. Each new knife becomes better, but it is not enough for him. He practices metal engraving, inlay and fine carving with one of the best masters in the town of Sopot. In the 90s he left the factory and devoted entirely to his passion. Making a knife includes a lot of skills. The master must be a locksmith, blacksmith, painter, engraver, carver, tanner and more. Despite the gravity of the craft, Stefan continues to enjoy his customers - hunters and collectors with knives made by him. In each product he puts a part of his heart and soul, a moment of his life. A cool weapon is one of the most prestigious and valuable gifts for each man. Kings and emperors have gifted the bravest knights and warriors the best weapons. 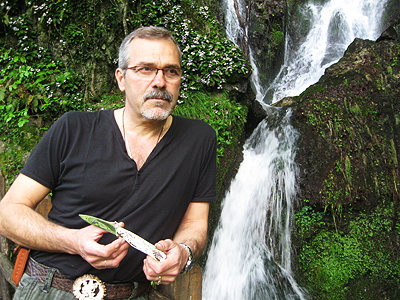 The knives made by Stefan are in three categories: art, hunting and folding.